The European Central Bank’s Governing Council is due to hold a policy meeting on 26 October, with many observers anticipating there could be a change to the ECB’s monetary stimulus programme. Corrado Macchiarelli, Mara Monti and Andrea Vedolin examine some of the measures that should be considered as the ECB looks to respond to changing conditions in the euro area. There are high expectations that during the upcoming Governing Council meeting on 26 October, the ECB will announce a tapering of its Asset Purchase Programme starting from next year. Still, ECB chief Mario Draghi has not formalised his readiness to unwind the purchases in the light of a strong and volatile euro. In the meantime, the ECB announced last year the launching of a Corporate Sector Purchase Programme (CSPP), enabling the direct purchase by the ECB of Investment Grade euro-denominated bonds issued by non-bank corporations based in the euro area in primary and secondary markets. 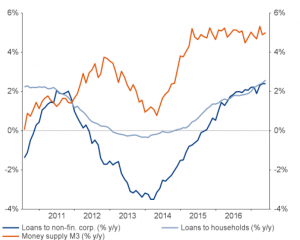 The lack of bank lending to the real economy in recent years, highlights that the CSPP may have been welcomed by corporates in the euro area. This is a crucial issue particularly for the universe of small and medium size enterprises (SMEs). In a recent note to the European Parliament, we evaluated the effect of these purchases on the real economy, and SMEs in particular, and discussed some of the challenges the ECB might face moving forward. In the note, we highlighted how recent developments in bond market conditions, while attributable to the technical support provided by the CSPP, reflect also an improvement in market sentiment driven by reduced fears about Brexit and European elections, together with a rise in flows into bond funds, which have helped to increase demand at a time when there is scarcity of European Investment Grade supply. The “supply response” from eligible issuers has nevertheless increased at the same time. Since the inception of the CSPP, new issuances of corporate bonds have picked up, especially for firms below or close to the eligibility frontier. Although most evidence is anecdotal (and it is too early to conclude that the increase in issuance volume was merely driven by the CSPP), several mainly large scale companies have taken advantage of exceptionally good market conditions to access the debt market since March 2016. In this respect, the improvement in financing conditions following the CSPP helped predominantly the universe of large corporations to finance themselves through capital markets. The programme has had limited effects so far for SMEs. As small-and-medium enterprises only account for a very small fraction of euro-area bond markets, the scope to buy SMEs’ debt directly is limited. In addition, many SMEs’ bonds do not possess an Investment-Grade rating and are therefore excluded from purchases. That said, however, the programme has spawned some favourable bond market conditions which have indirectly facilitated loans to SMEs as well, since large corporations have increasingly financed themselves through issuing bonds (rather than bank loans) thus releasing – on the one hand – capacity in the balance sheets of banks for potential SMEs lending. We advocated, on the other hand, that the ECB should consider programmes aimed at supporting credit directly to corporations of a small and medium size, along the lines of, for instance, the Bank of England’s ‘Funding for Lending’ (FLS) programme, as SMEs are the ones likely to need funding the most. It may be advantageous to bypass banks through the use of the CSPP, but it certainly will not be enough going forward. For the programme to be successful, the corporate sector will need to keep channelling the money borrowed to the real economy. This will be true as long as the restructuring and deleveraging of the banking sector continues. While the loan to retail funding ratio has strengthened since 2011, corporates in countries like Italy and Spain, where the banking system is more under pressure and the universe of SMEs larger, might benefit less from the CSPP. Loan provision by banks constitutes the overwhelming share of non-equity funding for euro area non-financial corporates, and, here, the impact of the CSPP on bank lending rates has been indirect and limited. 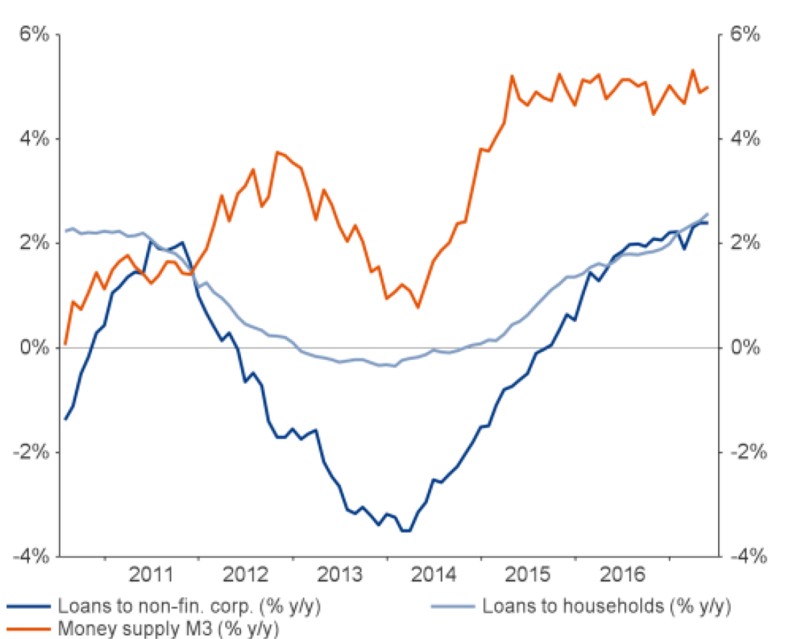 While it is possible that some corporates were successful in negotiating lower interest on their loans, with banks willing to compromise to avoid losing business, this does not appear to have happened on a sufficiently large scale to materially reduce average lending rates. To conclude, in the light of a weak (for now) link between better financial conditions and higher business investment, lending to non-banks should continue with a focus on lending to SMEs – this is particularly needed in countries with a frailer banking sector (mainly peripheral euro area countries) – in order to warrant a continuation of the process of a homogenous growth revival across the euro area. Andrea Vedolin is an Assistant Professor of Finance at Boston University.